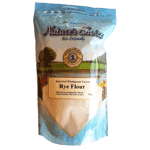 Nature’s Choice rye flour. While wheat flour predominates in the breads of southern Europe and the UK, rye flour plays a more important role in the breads of northern and eastern Europe. This is due to rye's superior ability to grow in the poorer soils and cooler, wetter climates of those regions.